HP's remarkable new Spectre 13.3 isn't just another MacBook Air rival – it could well have the measure of all ultraportable PCs (and those pesky iPad Pros). Despite the Intel Core i5 and i7 powerhouse chips you'll find in the competition, it has a super svelte aluminium body that's just over 1cm thick – 10.4mm. Or, as HP points out, the thickness of an AAA battery. If that's not enough to want one, we don't know what is. Could it replace the Dell XPS 13 and Lenovo Yoga 900 line as our PC ultraportable laptop of choice? Quite possibly – the Spectre 13.3 release date is July 2016 in the UK, with a price starting at £1,149. In the same way as Apple and Intel claimed to have redesigned every component when launching the original MacBook Air, HP says it has had to “reimagine every element of the design and engineering process”. The all-day (well, 9.5 hour) battery has a clever design, split into two thinner pieces that sit alongside each other. What else? Well the Spectre 13.3 boasts a full HD (note no QHD option) 13.3-inch diagonal edge-to-edge IPS display covered with tough Corning Gorilla Glass plus Bang & Olufsen-enhanced sound, too. SSD storage is on offer up to 512GB, with up to 8GB of memory, too. Weighing in at 1.1kg, the Spectre is fairly standard in terms of heaviness compared to the competition, despite a durable carbon fibre base. And you'll be fully immersed in USB Type-C with this laptop. It has three Type-Cconnectors, including two of which support Thunderbolt for rapid data transfer and connection to an external display. We can't wait to try one out. 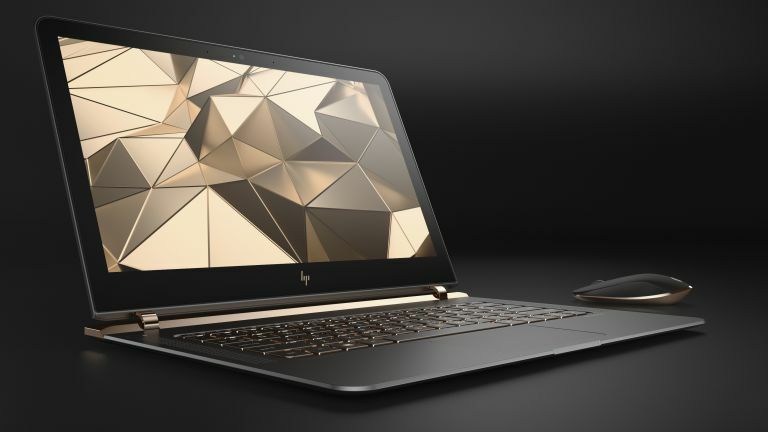 HP has also dropped a new 15.6-inch Envy x360 Hybrid, which has a 4K display option (usually it's Full HD) and is 21 percent thinner (around 18mm thick) with longer battery life compared to the previous generation. The new x360 truly is a dynamo with Intel Iris or AMD Radeon graphics in addition to the latest gen Intel Core i5 or i7 or AMD A9-9410 processors. It weighs in around 2kg, with up to 8GB of memory plus up to a 2TB hard drive and 256GB SSD as well. There's a single USB Type-C in addition to all the usual legacy stuff like USB 3.0 plus HDMI and card reader. The Intel-basedHPENVY x360 is available from July 2016 in the UK with a starting price of £779, while the AMD-based model starts at £599. Liked this? Check out our guides to the best laptop and best ultraportable laptop.